I remember learning about Chinese New Year back in elementary school. Well…truth be told, the only thing I truly recall are the red envelopes that were filled with money and an abundance of oranges or was it tangerines? Fast forward to my adult life. Working several years at a Pan Asian television station, I have discovered a little more about the festive holiday; not just from my Chinese coworkers, but also Vietnamese and Korean. I was lucky enough to share stories with my Asian friends and colleagues, be part of their lavish festivities, as well as receive those ‘lucky’ red envelopes. Our television station even produced several annual Lunar New Year Parades and Festivals in Los Angeles, as well as Pasadena for many years. 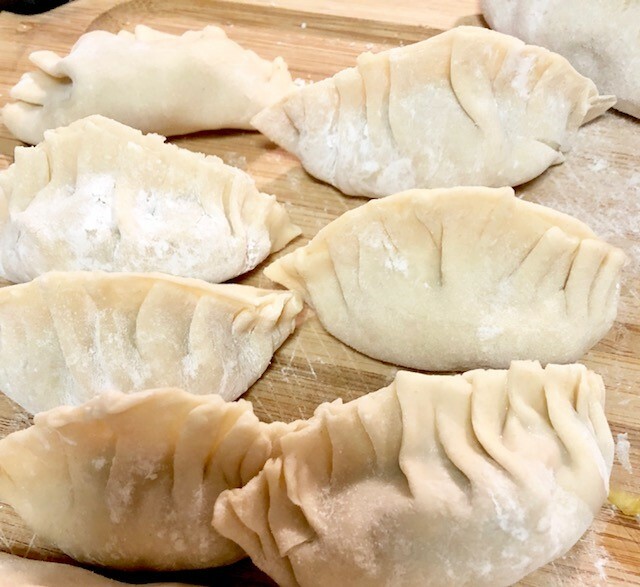 Today, to celebrate the closing of Lunar New Year, I will share my homemade dumplings recipe. It’s super easy….AND requires very little ingredients. In fact, you probably have all of the ingredients in your fridge already. I was craving dumplings one day and didn’t have much in my fridge and I was way too lazy to go to the market. So I just grabbed what little veggies I had in the fridge and made do. I decided to make the wrappers from scratch because, let’s face it…it’s more fun and satisfying that way. And also because there isn’t an Asian store close enough to where I live. So....here goes it. And just a note…these are NOT authentic Chinese dumplings. Just my own Westernized, quick and easy, ‘this will do for now’ experiment. Heat a pan or wok and add Olive Oil. Next add the garlic and sautee. After about a minute, throw in the chopped onions and continue to sautee until the onions look shiny and soft. Place the cabbage in the pan and stir slowly. Add a little water. 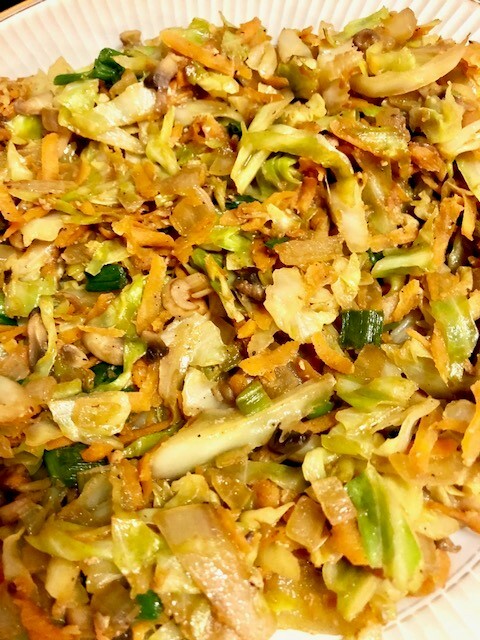 After about 3 minutes, when the cabbage is slightly cooked and tender, add the carrots and mushrooms. Slowly add more water. Season your filling with soy sauce, ground pepper, sesame oil, (optional oyster sauce) to taste. Cover your pot and let it simmer. Regularly stir your mix so it is evenly cooked. About a minute before your filling is done, add the green onions. (I don’t like my green onions overcooked). Once your veggies are cooked, you can turn off the pot. If your water evaporates before the filling is fully cooked, you can add a little more water. While your filling is set aside to cool, you can start working on the dumpling wrappers. In a bowl add the flour and slowly pour in the hot water and stir until the water and flour are mixed together. Then, using your hands, knead. If you notice the dough is sticky, add a little more flour. It should not be sticky. Cover the dough and set aside for 30minutes. Add a little cornstarch to your work surface to prevent it from sticking. Now cut your dough into pieces and flatten with a rolling pin. You can roll into squares or circles. You can stack the wrappers on top of each other. However, remember to use cornstarch in between them to prevent from sticking together. Add the filling into the wrapper and seal the dumplings using water. You can pinch the wrappers to close or use a fork to seal the dumplings. Steam the dumplings or pan fry to a golden brown. Enjoy! Dipping Sauces: you can use store bought dumpling/gyoza sauce or sweet chili sauce, or make your own sauce from home. I prefer mixing soy sauce, vinegar (or rice vinegar) and ground pepper. Usually the ratio for the soy sauce & vinegar is 2:1. (Lemon can also be used as a substitute for the vinegar).